Its been a long time, and many things have happened…but among those things was a switch of carriers for the Two Tech Geeks (from Verizon to T-Mobile) and a new daily driver phone, from the LG G3 to the Nexus 6P. Mrs. Tech Geek also got an LG G4….more details and some thoughts on that to come soon as well. But for now…since the 6P has been in my hands for a couple months now, let’s get into what I like, don’t like, and whether the Two Tech Geeks recommend this first Nexus from Huawei. The specs are cutting edge and it shows. The display is Samsung current generation, and is bright, sharp, and represents what is best about AMOLED tech. Colors are vibrant and pop, and the blacks are deep and true. The size of the display is great for viewing video and web content (more on the overall size of the device below), and details are rendered crisply. Performance is as snappy as you’d expect from a Snapdragon 810 with 3GB of RAM and running stock Android. I’ve yet to encounter any lag or delays with anything (other than the camera, which will be discussed below) – the battery life is also quite excellent, with stock Android (including the Doze feature) and the large capacity battery. Its very common to get through a typical work day with 2.5-3 hours of SoT with around 45% of the battery left. On light usage days, the battery will easily last a day and a half. I’ve gone upwards of 33-34 hours off a charge before having to find the charge. Speaking of chargers, the USB-C charging port is a handy thing to have. No more fussing with which direction the connection goes before popping the cable in – you can do it bi-directionally. And USB-C supports rapid charging, which is no joke. I can go from 50% to fully charged in the time it takes me to get in the shower and get ready for work (usually an hour and a half) which means you can leave it off the charger longer, which hopefully will extend the life of the battery (due to fewer charging cycles per day) *This is important because of the lack of a removable battery. Only bummer with USB-C is its not related to the Qualcomm Quick Charge technology…so you have to find both a cable and adapter that will allow for the native USB-C rapid charge. The stock charger does this…I’m still looking for a few more that will. Now – fingerprint scanning can be great (see my article on iPhone 5s) or it can be a bust (see everything else) – until now. I don’t know who designed or made the Nexus Imprint (contained in the ring on the back of the device), but this is some of the best fingerprint scanning technology in use today. Contactless, and fast as all get out. Not only does it unlock the device, it will wake and unlock from sleep simultaneously in almost no time at all. Add in its native support in Android M for future use and support, and you have a real winner. It can also make mobile payments a snap, with Android Pay and Google Play both supporting use of the fingerprint scanner for payments for just about anything that uses the internet or NFC for your phone. I’ve used it at many merchants and now my forgetting my wallet when going to lunch is a mere annoyance of the past – I can now pay with my phone! The overall size of the display on the Nexus 6P is great, the overall form factor isn’t terrible (it lands in at basically the exact same footprint as iPhone 6S+) but it is a big phone. And this is coming from someone who has increased the size of their device and display every year for the last 5 devices. You do adapt and get used to it. I’ve got medium-to-large size hands, and I can basically do just fine with it after a case and some practice. But for those who are in love with their Galaxy S6 or iPhone 6 – you will want to get a 6P in your hands first and play with it before making a final decision to buy. Or play with an iPhone 6S+ for a day…that would serve as an adequate stand in. The front facing speakers are good quality, nothing special, and get loud enough for most things. Notifications and music are fine, most movies are fine…I wished for a little bit more volume in quite a few settings, but its good enough from a phone. You’ll love just having them on the front though. No more cupping the back of your phone to try to get the movie you’re watching a little bit louder. So even though the design is good, the volume rates only 1 thump up here. The camera performance for me has been really good, not on the level of the G3 or G4, or even the Galaxy 6/Note series, but really good. Some will knock the lack of OIS in the sensor, and this is a valid concern, but I’ve not really noticed a big issue in day to day usage. I don’t take a lot of video, an this could be why my experience is different from a lot of the other reviews and websites, but I think in general it performs well in good light, low light, and most things in between. There is a bit of lag when using the stock camera UI, especially if using HDR+ mode (which really is the best way to capture much better images) – so if mobile phone digital photography is your thing, you’d probably going to want to look elsewhere for your device. But if you need a better than average perfectly adequate mobile phone camera, look no further. The device feels solid in hand, and the aluminum chassis is a nice classy touch. It feels good (if a touch big) and is thin and sits in the hand well. Some have noted the notorious “does it bend?” test; others have seen a slight variance in the angle of the front display that can cause some issues with applying a tempered glass screen protector (I was one of these) – all of these are true to a greater or lesser extent, but at this point, we’re probably splitting hairs. Its a good looking well built device, and don’t let any blogger tell you different. Having a stock Android experience on board means you get the best of what Google has to offer. And like the saying goes, you’ve come a long way baby. I can remember the days of hoping and praying for Ice Cream Sandwich to come to my phone…and Marshmallow represents the pinnacle of Google’s Material Design. When you’ve used a skinned phone (like TouchWiz from Samsung or the LG Optimus skin) you don’t really appreciate the simple purity of what Android has become. Its clean, elegant, and very intuitively useful. 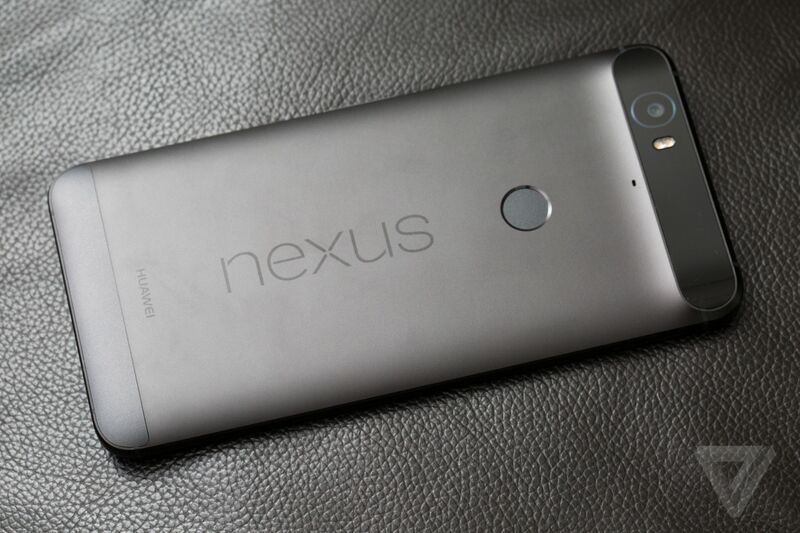 And you know with a Nexus that you’ll always get the fastest updates possible, which can be very important for some. The monthly security updates are a nice new touch as well – something most of the OEMs have committed to, as well as Google. Coming from the G3, and with the wife having a G4, sometimes I really miss having an SD card slot. I splurged for the 64GB storage in my 6P, so storage isn’t really an issue. But with kids and taking pictures all the time, its WAY easier to pop out an SD card and replace it, rather than have to download all my photos off the 6P once a month. Same with a removable battery…its nice to occasionally pop the battery out in case you need a freshie or just need to do a battery pull for getting something stuck….unstuck. I can’t believe there isn’t a “reboot” option built into stock Android still…just that old “power off” feature. Maybe someday? But since the 6P has a great size battery for its footprint, having a need to change out a dead battery for a charged one doesn’t really come around well….ever. At least not for me. And if you get low, USB-C rapid charging has got you covered. So its really a non-issue with both the external storage and sealed battery – some folks may want to pursue a G4 or V10 if those items are deal breakers. While stock Android is great, some apps won’t have full compatibility with it yet, as developers work to catch up to its new twists and wrinkles. I was disappointed to find that one of my favorite apps (Tasker) lost a few permissions that I used frequently due to the Android 6.0 changes. These should mostly be resolved, given time. So again, mostly minor quibbles…nothing that’s really a deal breaker for this device for most common, every day usage. Without anything that really gets a thumbs down, the Nexus 6P is a great Android device; in fact, its one of the best that money can buy right now. There aren’t a lot of compromises here, and the stuff that Huawei managed to pack into a device the size of the 6P is remarkable. Its available for all the major carriers, and simply put – for the money, there isn’t a better Android phone you can buy.